Various sketches of the head of a woman: on the right is a sketch of the head turned to the left, looking down three quarters left, with the hair elaborately coiled and braided. Beneath this is a drawing of a head seen from the back. On the left are three quarter and rear views of the same subject. These are studies for the head of Leda in the lost painting of Leda and the Swan. The mythical Leda was seduced by Jupiter in the form of a swan. Leonardo worked on two compositions of the subject, finally executing a painting that was destroyed in the eighteenth century. 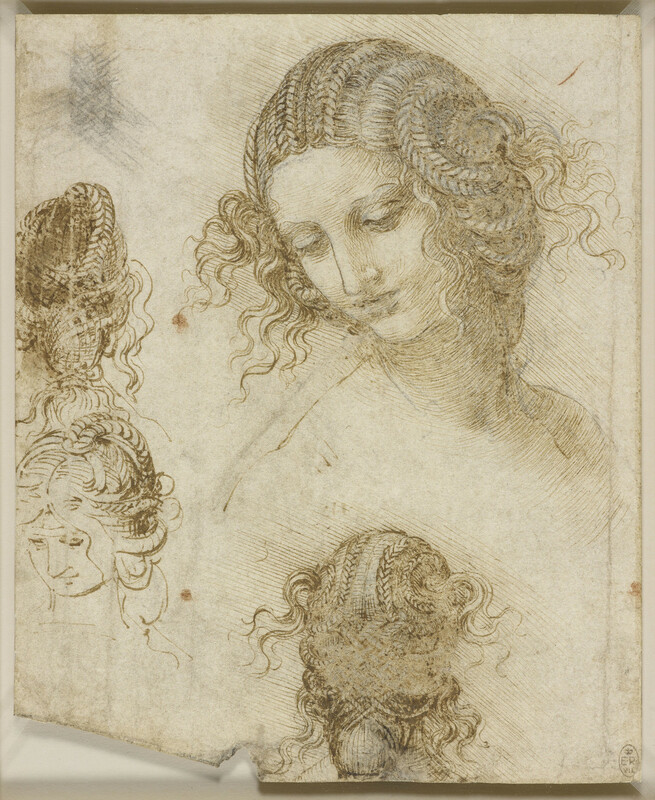 In the four surviving studies of Leda's head, Leonardo expended little effort on her expression, simply adopting the usual downward glance; in the central two drawings he may even have left the face blank, for the faces there are of poor quality and may have been 'filled in' by a pupil. Instead Leonardo devoted all his attention to the most complicated of hairstyles, with dense whorls and woven plaits, even studying the head from the back - quite unnecessarily for a painted image.